Power outages can occur at any time and can be caused by heatwaves, bushfires or storms. A tree interfering with powerlines is often what causes preventable power outages. You can help by regularly checking the trees on and nearby to your property. If the tree is on your property – a qualified tree clearing professional. If the tree is in the street – call your local council or electricity distributor. To find out who is your electricity distributor click here. 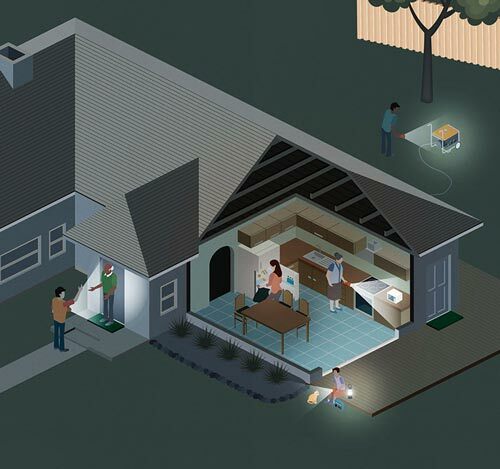 Be prepared for power outages – ensure your emergency kit has torches, spare batteries, a mobile phone and charger, a battery powered or wind-up radio and fresh water. If the power goes out your landline phone and any electric pumps may not work. Stay clear of any fallen powerlines and keep others away. Check in on neighbours to ensure they are okay. Keep a radio on for news and updates on weather conditions and the power outage. ABC 774AM is the local emergency broadcaster. 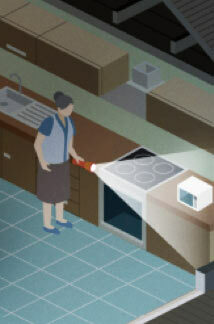 Turn off appliances to protect them when power is restored. It is a good idea to keep one light switched on so you know when the power is restored. If there has been significant damage to your property, make sure a licensed electrician checks that it is safe to turn the power back on. 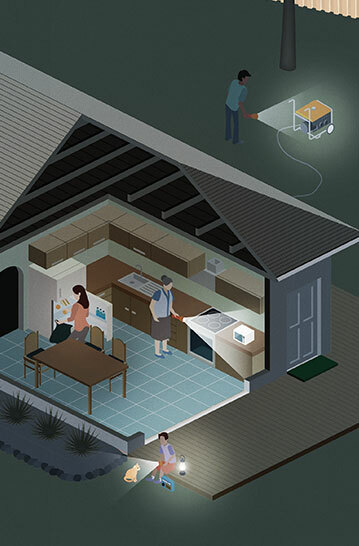 If using a portable generator, plug appliances only into the outlets provided on the generator. Do not attempt to connect the generator to your house wiring and make sure the generator is outside in a well-ventilated area. Be safe with food – see below. Never use candles near flammable materials such as curtains. Only use candles on stable, non-combustible surfaces. Never leave candles unattended. Never use generators or outdoor gas heaters inside. Never do you own electrical work – DIY electrical work is illegal and very dangerous. Are on life support equipment. Have a medical condition that requires continuous power supply. You should report your needs to your electricity retailer so they can contact you in the event of an outage. Make sure they have your up-to-date contact details. During a power outage it is important to be safe with food to avoid food poising. The most important thing is to try to keep cold and frozen food cold. If food is still cold to touch (less that 5°C) it is safe to use. Try to keep cold and frozen food cold. If food is still cold to touch (less than 5°C) it is safe to use. Once cold or frozen food is no longer cold to touch (5°C or above) it can be kept and eaten for up to 4 hours and then it must be thrown away. Raw meat should be cooked and eaten. If available, put bagged ice under food packages and trays stored in the freezer and fridge. For more information on food safety, call the Food Safety Hotline on 1300 364 352 or click here.